Here the climate in chennai is cloudy and breezy. The Lightning and thunder's are really threatening..i have never heared such fiery thunderstorms all these years. Rain pours and pours with little passes in between. In this case, i just could watch some classic DVD's. and very rarely i get the mood of weB-LOGGING. Though i have lot of recipe's for posting it..these Vazhathandu/Banana Stem Soup recipe is having much priority, as it needs to be introduced to many people, specially for people in chennai. 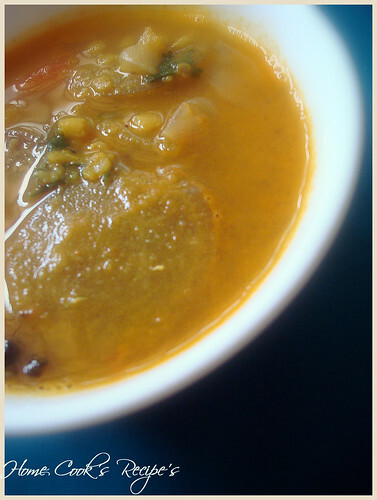 First i will share about this Vazhathandu Sambhar, this is my favourite sambhar. i remember my grandfather making me eat these vazhathandu/banana stem, by telling, it will clear if any stones are in your kindney. 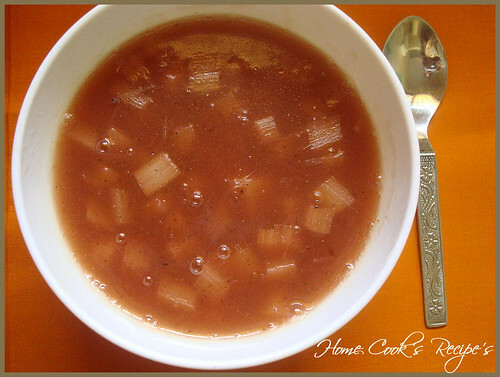 If you have never tried Banana stem before, this is a good way to start, by trying Banana Stem/Plantain Stem Sambhar. For this, You have to cut the stem in round shapes of medium thickness..just pressure cook them along with tuvar dal/moong dal. 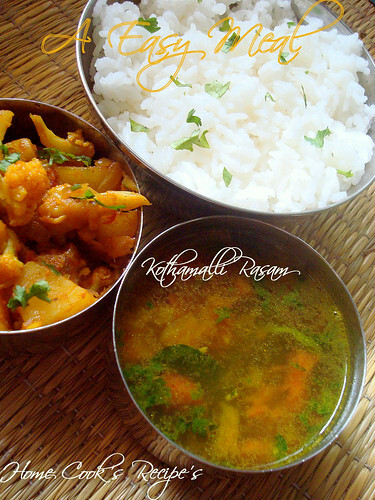 and follow your usual Sambhar Recipe. 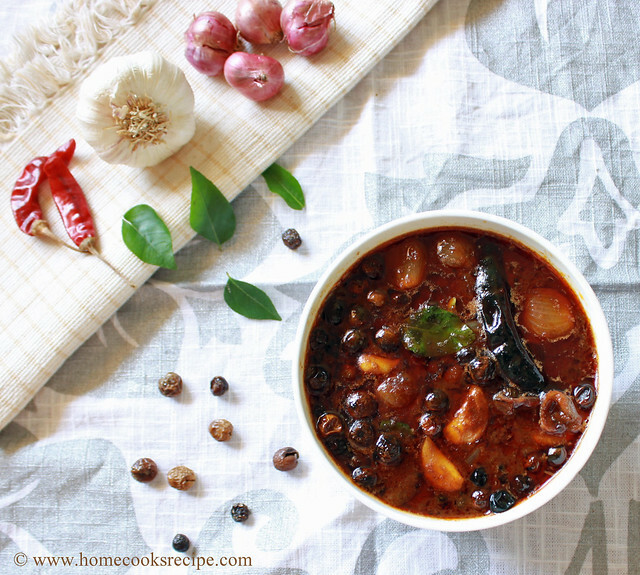 For My Sambhar Recipe, Check Here. Coming to the Soup Recipe..Cut the Plantain/Banana/Vazhathandu Stem into small small pieces. Let them boil in Water, till they get cooked. you can see the color change. take a spoon of corn flour and mix with a small cup of water. mix well without any lumps. now add the corn flour water to the pan, in which the plantain stem is boiling. add salt and pepper powder to it and let it boil and remove from the flame. if you wish, you can add sauses before serving. I do not want to blog simple recipe's.. This recipe may be simple, but i felt it is worth of sharing. During these rainy day' s, i want my lunch to be hot, light and satisfying. This Rasam fits all these criteria. Serving some pappad's or some potato chips along with, will be a real filled meal. This is best for digestion and best charger-when you have cold, as the recipe calls for pepper corns. 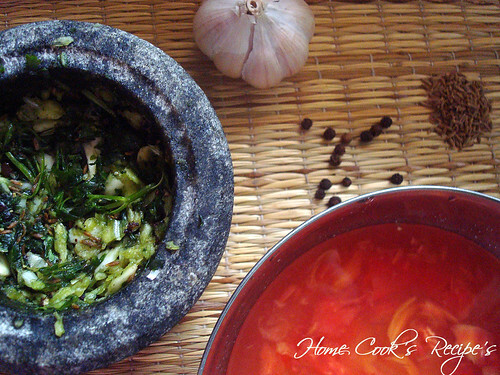 Ground the spices-Garlic(5 cloves), cumin(1 tbsp), Corriander leaves(leaves of 6 stems) and Pepper(8-10). You can use the Pulse button on your mixer grinder to ground the spices. Dont Forget to smell at this stage..a refreshing aroma it is.. In a cup of water, sqeeze the tomato well and set them aside. 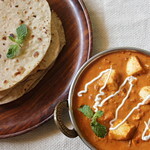 In a pan, heat the oil, when heated, add some cumin seeds and asafoetida powder. if you want some extra spice, add red chilli's. Now add the ground mixture and saute it for half a minute. Add the tomato water and a pinch of turmeric powder and salt required as per your taste. Dont Let it boil. just heating is enough. it just takes another half a minute. A Real Refresher for the winter. 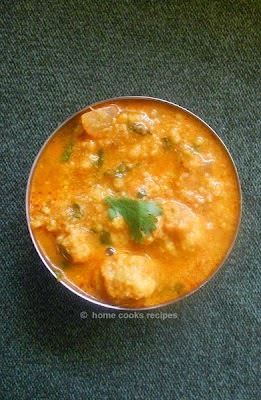 I served it with aloo gobi fry, which was so divine combination. Take the Gram flour(Have 2tsp aside-for making kadhi), add few cumin, asafoetida, chilli powder, little salt, baking soda and mix well. add little water and make it as your Bajji/Fritter's dough. Heat oil and fry this Pakodi's till they are cooked. need not fry till they reach golden color. Now keep your pakodi's aside. Have a cup of curd, and add little turmeric powder, chilli powder, salt, asafoetida and mix well. set this aside. Now in a pan, add 2 tsp oil and heat it, when its heated, add mustard and let it make some sound, add the cumin and curry leaves. add onion's, finely chopped garlic and fry them. now add the curd mixture and the pakodi's. let them on stove for 2 more minutes and switch off the flame. 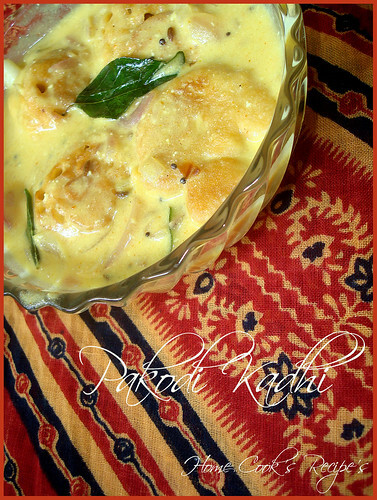 You can prepare this in less than 15 minute's and this is perfect with rice and chapathi's. Scroll Down to Catch up Other Foodie's.. Yesterday, i watched Bhopali Korma. a non-veg dish on NDTV GoodTimes. Soon after the show, i went and cooked this for our dinner. 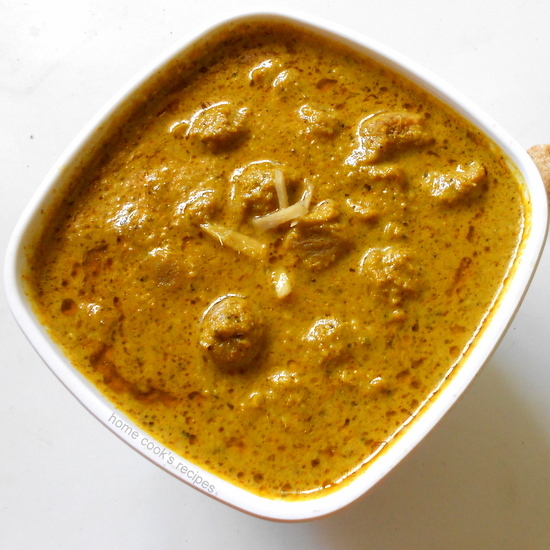 it just took less than 10 minutes to prepare this yummy, Korma. 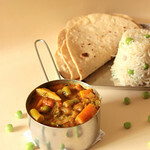 If you are in short of veggie's, then this is going to be a very good pleaser on your Lunch Table. Soy food should not be taken during dinner, as it takes longer time to digest. 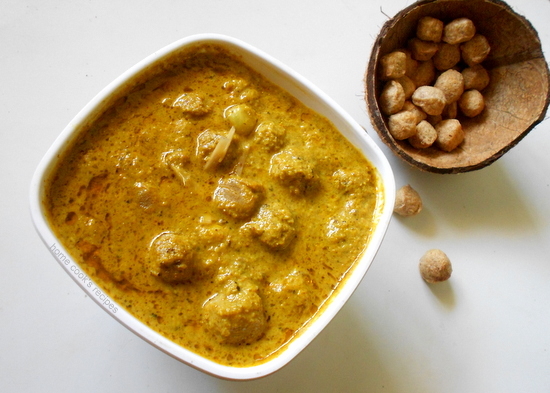 For Non-veg version/the original recipe, check here. Here comes my recipe, with some customizations. Prepare the paste and keep it aside. Now in a pan, heat the oil, when it splutter's, add the finely chopped ginger and garlic and roast them. On then add, the soy chunks, which you got to boil for 5 minutes with little salt and squezze it and then wash them in cold water and squeeze them again. now mix the squezzed soya chunks along with the ginger and garlic. Now add the Grounded paste to the pan and mix well. Add vegetable stock, salt, chilli powder and mix. let them rest in the slow flame, till it emits oil on its sides. 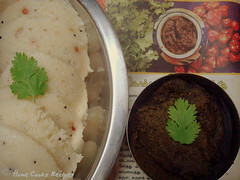 Enjoy with Rice or Chapathi's. * Don't use tangy curd, it may change the taste. * This is a 10 minutes whip-out, with minimal work. I was intoduced to Pumpkin, through Cindrella's Carriage. Every Girl would have dreamed to have a Carriage, Glassy Shoes, and ofcourse Prince Charming. Anyway in reality we get all in little size or some compromise have to be done. coming to the topic, i cook pumpkins only during Pongal, and thats Sundu Curry. 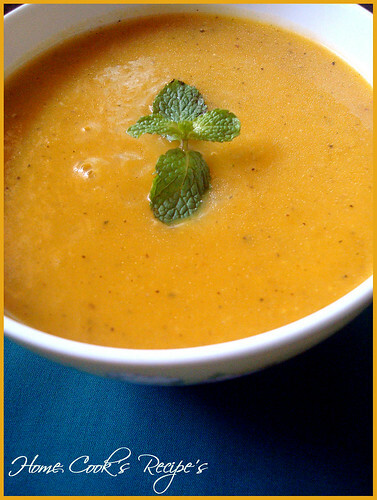 After looking at all your Pumpkin Soup's, i could'nt resist more in trying it. here it is..
My Recipe is so simple, i just sauted the pumpkin cubes in two spoons of oil and grinded them by adding little water. then i made them boil and added little pepper and salt. Yes, you guessed it right, such a lazy recipe. no onion's, no cream, nothing. yet it was so delicious and iam going to try next time with little addition's. When ripe, the pumpkin can be boiled, baked, steamed, or roasted. Often, it is made into pie, various kinds of which are a traditional staple of the Canadian and American Thanksgiving holiday. Pumpkin is used for sweet dishes; a well-known sweet delicacy is called halawa yaqtin. 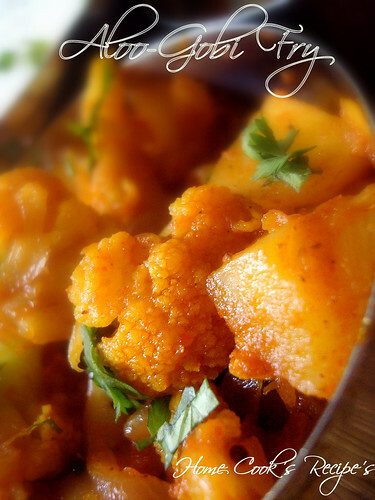 Pumpkin is cooked with butter, sugar, and spices in a dish called kadu ka halwa. The leaves of the pumpkin plant are consumed as a cooked vegetable or in soups. Pumpkin is often roasted in conjunction with other vegetables. Small pumpkins are served in savory dishes, including tempura. Small pumpkins are steamed with custard inside and served as a dessert. Pumpkin can be used with cheeses as a savory stuffing for ravioli. 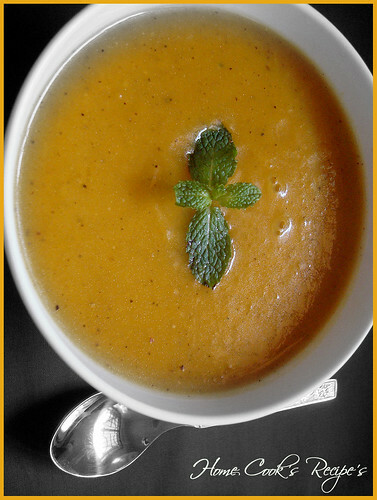 If you havent tried Pumpkin Soup, Give a shot this Winter.